This document is primarily designed for my own records for future use. However, it is always nice if it may help others to get started with Linux on their laptops. The steps to get things to play on the Acer Ferrari 3400 Lmi are described here. Most procedures are general and may be useful for other hardware as well. However, I must warn those of you that still enjoy the luxury of an independent mind and free will. Stay away! Do not ever lay your hands on the Ferrari. The same warning applies to the GNU/Linux software platform in general. It was several years ago my self defense was totally broken. Please feel free to comment on any topic or possible improvements in this document. This is an updated version of this document. This time I have chosen to install Fedora 8 x86_64, and many things has really changed to the better. The first version dealt with FC4-x86_64, and there are no major changes for FC5-x86_64. Consequently, if you are heading for FC4 or FC5 you probably want to have a look at the previous version of this document. While some details may be specific for Fedora, most stuff should translate to other distributions as well. CPU OK Mobile AMD Athlon 64 3000+ No configuration needed. Even freqency scaling works out of the box. PCI Bridge OK VIA VT8237 [K8T800/K8T890 South] No configuration needed. Display OK 15" SXGA TFT (1400x1050) No configuration needed. Graphics card OK ATI Mobility Radeon 9700 128 MB, 8x AGP Full functionality with the radeon driver, see below. RAM OK 512 MB DRAM (extended to 2GB) No configuration needed. Original: Hitachi Travelstar 80 GB Ultra ATA 100, IC25N080ATMR04-0, 4200 rpm. NIC (wired) OK Broadcom NetXtreme BCM5788 Gigabit Ethernet No configuration needed. NIC (wireless) OK Broadcom BCM4306 802.11b/g W-LAN Use kernel module b43, see comments below. Modem OK VIA AC'97 56k Modem. Unstable. See below for configuration. DVD drive OK Matshita DVD-RAM UJ-825S (DVD/CD +/- R/W, DVD-RAM) No configuration needed. Sound OK VIA VT8233/A/8235/8237 AC97 Audio No configuration needed. Touchpad OK Synaptics SynPS/2 with 4 multi-buttons No configuration needed. Multi-buttons works as well. Suspend to disk, etc. No configuration needed. Works out of the box. Special keys & buttons OK Mail, web, P1, P2, volume, mute, Fn-*, etc. See below for configuration. PC-card OK Texas Instruments PCI4510 PC card/Cardbus No configuration needed. Bluetooth OK Cambridge Silicon Radio No configuration needed, see comment below. IEEE 1394 Firewire OK Texas Instruments PCI4510 IEEE-1394 No configuration needed, see comments below. USB OK VIA, 4xUSB 2.0 No configuration needed. Infrared OK See below for configuration. Card reader OK 5-in-1 (MMC, SM, SD, MS [Pro]) No configuration needed. No special procedure is needed during the core installation of F8 x86_64. Partition the hard drive as desired and install the components that you like. However, some packages will make life easier when configuring your new laptop. These are mentioned in the corresponding sections below and may be installed afterwards. Depending on your setup there are some pitfalls you should know about. This tells the installation to disable the frame buffer so you may use the graphical mode of the installer. Otherwise you will loose the display shortly after the installation enters graphical mode. This only applies to FC4 and earlier. However, depending on your hardware you might notice a strange disk size during the installation of F8. If you see a disk size less than expected you should pass the kernel option libata.ignore_hpa=1 to the installation. 1. When you see the graphical boot screen, press tab. No hassle what so ever, but my own reflection is that the standard hard drive does not match the “high end gear” profile of this laptop. When the laptop was released 120 MB drives was the latest of the greatest and 100MB drives were off the shelf goods in most stores. However, a smaller drive would have been ok at a higher speed, at least 5400rpm. I am addicted to VMware and want extra of everything, size, speed, RAM, etc. Thus, I have replaced the original Hitachi Travelstar 80 GB (4200rpm) drive with a Seagate Momentus 160 GB (5400rpm, ATA/ATAPI-6, ST9160821A). What a difference! The higher speed, as well as the higher storage density, pays off in far better performance. Operating temperature is the same as for the original drive. According to the smartmontools it runs at 40-48 °C during normal load with peaks above 50 °C during heavy load. A highly recommended upgrade! With FC5 and later there should not be any problems with the IEEE 1394 Firewire support. For me it works just as smooth as the USB support. If you are running kernel version 2.6.14 or later you may skip this section, unless you have specific interest in tweaking you Firewire settings. A new alternative driver stack for Firewire support (a.k.a Juju) was introduced as experimental in kernel version 2.6.22. In Fedoras kernel configuration 2.6.23.9-85.fc8 the new IEEE1394 driver stack replaces the old drivers. The rest of this section deals with the old driver stack, i.e before Fedora kernel 2.6.23.9-85.fc8. For the most recent information please refer to http://www.linux1394.org. However, on systems with kernel version 2.6.13 or earlier some might experience problems with the Firewire support due to different default values used in the kernel module. First a short description of the potential problems. Copying 430 MB takes 20 minutes 29 seconds (comparable to USB 1.0 performance). However, the “actual” time is less than 7 seconds. 20 minutes and 22 seconds are spent waiting. Waiting for what? I do not know, but obviously some bits and pieces fail during the transfer. Furthermore, I do not feel comfortable with the data integrity when I see these kind of results. After some digging in the kernel documentation and a quick look in the sbp2.c source file it turned out that this problem probably is related to a “buggy IEEE 1394 chip” in the external device. The proposed solution is to load the sbp2 module with the argument serialize_io=1. It turned out really well, so here are some tips regarding the IEEE 1394 configuration. The serialize_io=1 option tells the scsi drivers to only send one scsi command at a time. Unfortunately, this setting has a small impact on performance, but it is the fix that makes things work. In kernel version 2.6.14 the default value for serialize_io was changed from 0 to 1. Thus, if you are running kernel version 2.6.14 or later you should not need do do anything, unless you want to optimize performance (see comments below) or fiddle with the other settings. That is what I call improvement! Going from over 20 minutes down to roughly 25 seconds. After some further exercises with other external hard drives it turned out that the problem described in the previous section indeed seems to be related to the IEEE 1394 chip in the external drives. With some hardware it is quite possible to use the faster serialize_io=0 option. The performance benefit is in the range 20-25%, so consider your options. If you only use IEEE 1394 for your own hardware and it works well with the faster setting, go for it. Otherwise, compatibility with other hardware might be more valuable. Personally, I think it was a wise decision to change the default setting in the sbp2 module. After all those “buggy IEEE 1394 chips” seem to be quite common, and prior to start optimizing performance you just want things to work. USB support works as expected. I have noticed no problems what-so-ever with the USB ports. Especially with the desktop enhancements introduced with FC5 it works like a charm. Absolutely no configuration needed. The 5-in-1 card reader utilizes the USB interface and is operational right after installation. Analogous to the USB ports there is no hassle at all. I have only used the PC-card slot for a Compact Flash memory adapter and it just works. True plug-and-play. The Mail button gets a pre-configured key code of 155 by Linux, but with X loaded the key code is 236. The buttons WWW, Fn-F4, Fn-F5, Fn-F8, Fn-up and Fn-down show similar behavior. The buttons P1, P2, Fn-F1, Fn-F2, Fn-F3 do not have pre-configured key codes, while their respective scan codes are e074, e073, e025, e026 and e027. However, in single user mode they all lack scan-codes. I do not know why. However, do not despair. It is possible to get all of the special keys & buttons working. Here is a short summary of my current status on this issue. Fn-F4 yes Sleep-button recognized by ACPI. Fn-F5 214 none, but generate a Capability changed event that is received by the X-server. These are the buttons that are the simplest to get working. Save these X key-codes for future use. First we need to get the other keys to show up under X as well. In order for them to do so they need properly configured Linux key-codes that they lack for the moment. This step is different and considerable easier under F8 than FC4 or FC5. There is no need to shutdown X now as before. # dmesg | tail atkbd.c: Unknown key pressed (translated set 2, code 0xf4 on isa0060/serio0). atkbd.c: Use 'setkeycodes e074 <keycode>' to make it known. atkbd.c: Unknown key released (translated set 2, code 0xf4 on isa0060/serio0). atkbd.c: Use 'setkeycodes e074 <keycode>' to make it known. Next, figure out what Linux key-codes that are available by looking at the Linux scan-code - key-code mapping. First we need to set a Linux key-code for the keys that lack one. Add the following lines to /etc/rc.d/rc.localto set the key-codes after all services are started. In order to avoid a restart to load these setting, issues the very same commands. Finally it is time to configure the button actions. Actions for all but the audio control keys are easily configured in the KDE Control Center -> Regional & Accessibility -> Keyboard Shortcuts under the tab Command Shortcuts. If you want to use the Fn-F5 key to manipulate the graphical output, refer to the section 10 Graphics below. A pleasant news is the advancements in ACPI support. Now all the desirable features are working right out of the box, without any configuration. I am glad to see that both Suspend to Disk and Suspend to RAM works like a charm. Previous there has been a lot of struggle, if at all possible, to get a stable and reliable ACPI support. OK, I know that suspend has been around for a while by now, but hand on the heart - has it been user friendly and reliable? I have not had that experience. So a reliable ACPI support right out of the box feels really luxurious. Even the special sleep key, Fn F4, is configured during the installation and works as expected (Suspend to RAM). The power button works of course as well, as it always has done. The CPU frequency scaling has been working for quite some time now. So it is no big surprise that it works out of the box in F8 on this puppy. However, it is always nice to see things evolve and improve. The improvements of the suspend functionality mentioned above together with solid CPU frequency management really shows off in power management. KPowersave now feels really mature and has three pre-configured CPU policies: Performance, Dynamic and Powersave. Dynamic is the default and there is no real reason to change it. The advancement of Xorg and its related drivers and modules has been enormous the last two years. Fedora 8 includes Xorg 7.2 which is a welcome improvement in X-server configuration. Furthermore, there is absolutely no need to use the ATI proprietary driver any more. This is a true liberation, for sure I will not miss all the violations the proprietary ATI driver did to my Xorg configuration. The graphical hardware is properly identified and setup during the installation, so you will enjoy X11 right from the start. Another nice thing is that the dim display button, Fn-F6, works without any configurations. The Ferrari 3400 is equipped with a ATI Mobility Radeon 9700 chip. This chip has 128MB of memory and provides two external outputs, VGA-0 and S-video. The built-in display is called LVDS. These names refer to the definitions used by the radeon X driver. The graphical chip has 2 CRTCs, eg pipeline for rendering graphics. This means that only two outputs may be active simultaneously, either LVDS + VGA-0, LVDS + S-video or VGA-0 + S-video. This is a common limitation for most graphics hardware. Note: The output names differ depending on the driver used. The names used in this document relate to the radeon driver. If you use some other driver use xrandr -q to find out the proper names (provided that it supports RandR). Support for the ATI Mobility Radeon 9700 chip in the Ferrari is provided by the radeon driver. This driver supports all the features we want: the RandR extension (v 1.2), 3D acceleration (DRI) and TV-out. There is also the ati driver, not to be confused with the proprietary fglrx driver. However, the ati driver is only a wrapper that auto-detects ATI cards and load the appropriate driver. In our case that will result in the radeon driver being loaded. The main improvement in Xorg 7.2 is the arrival of version 1.2 of the X RandR (Resize and Rotate) extension. It provides automatic discovery of modes together with the ability to configure outputs dynamically. As of today only a few drivers support RandR 1.2. Fortunately, the radeon driver is one of them. If you are familiar with X configuration and take a look at the default /etc/X11/xorg.conf file, generated during the installation you will notice a significant change. Many of the traditional settings, sync and refresh rates, modes and modelines, are gone. All these settings are now auto-detected by RandR 1.2 and should only be present if you want to override the detected values. In some rare situations this might be needed, e.g. when an external monitor reports incorrect values. In order to get full dual-head support you only need to add one line to the default X configuration. If you want to optimize 3D acceleration you need another line. That is a total of two lines for a full fledge X configuration supporting all features. Quite an improvement. Thank you all nice X guys! The X server log file /var/log/Xorg.0.log will be your valuable companion when it comes to troubleshooting or just checking what configuration that is auto-detected. For reference my xorg.conf is presented in Appendix A. The X Resize and Rotate (RandR) extension introduces a significant shift in dual-head configuration with its version 1.2. All your setting may now be altered on the fly by the command line tool xrandr, and there is no need to restart the X server. RandR works its magic by means of a virtual screen that is larger than the a single monitor. This is the most (only) important setting needed in xorg.conf. However, in order to enjoy hardware support for 3D acceleration the virtual screen may not be larger than 3000x2000. This limitation differs for the various driver, but for the radeon driver the limitation is 3000x2000. This is sufficient for having an external monitor running at 1600x1200 side-by-side with your internal display as 1400x1050. In the xrandr -q output above we see that the new virtual screen size is recognized in the maximum value. Furthermore, we see our three supported outputs, VGA 0 (external display), LVDS (internal display), S-video (TV-out). For the report above an external monitor is connected but not activated. Still xrandr -q reports its supported modes. Neat! It is highly recommended that you read through the man page for xrandr and play with it a bit to get to know it. A good place to start is at the debian wiki http://wiki.debian.org/XStrikeForce/HowToRandR12. It is a great tool that you most likely will find useful. Connect an external monitor and try the following commands. Once the virtual screen is configured and we feel confident in xrandr, it is time to focus on the Fn-F5 special button. By default it does nothing, but now we have the tools to configure it the way we want it to work. First the Fn-F5 button needs to be recognized, so please refer to the section 8 Special keys & buttons above for the basic setup of the Fn-F5 button. After that we design a script to run once Fn-F5 is pressed. The Fn-F5 button should provide a simple, basic and robust functionality that works for any external monitor. I prefer to toggle through the available connected external outputs, while keeping the internal monitor alive. Furthermore, each connected external output is present in two operating modes. First the external output mirrors the internal display, then it extends the desktop by operating side-by-side with the internal display. When both VGA-0 and S-video are connected the following operation modes are toggled each time Fn-F5 is pressed. If a certain external device is not connected those modes are skipped. Consequently, the sequence above will only appear when both VGA-0 and S-video are connected. With only VGA-0 connected the sequence will only include the first three modes from above. Notice that the internal monitor may be dimmed at any time by pressing the Fn-F6 button. Thus, turning off the internal monitor is not included in the script. The script is outlined in Appendix B and may be downloaded at http://ferrari.database.se/3400/f8/dual-head.sh. Binding this script to the Fn-F5 button is then configured in the KDE Control Center -> Regional & Accessibility -> Input Actions. in the Device section of the xorg.conf file. 3D hardware acceleration is provided by the dri module. This module is loaded by default by the radeon driver, so no additional configuration is needed in xorg.conf to get hardware support for 3D. However, any possible optimizations that might improve performance are desirable. In order to compare different settings we need some kind of benchmark tool. A simple tool that comes with the glx-utils package found in most distributions is glxgears. It may be rough, rudimentary and lacking a lot of hype features, but it is present and sufficient for our needs. An interesting exercise is to explicitly disable hardware acceleration and comparing the result with the default xorg.conf. Without hardware acceleration glxgears clocks in around a modest frame rate of 150 FPS, compared with approximately 2050 FPS for the default configuration. This is quite a difference, and it verifies that the radeon driver really does its job. The default values for most settings work well and there is no needed to modify xorg.conf. Furthermore, most of the other settings are correctly auto-detected, such as AGP 8x and memory. All this is reported by the X server in its log file /var/log/Xorg.0.log during startup. The options of most interest for performance are AccelMethod (default XAA), AGPMode (auto-detected), ColorTiling (default on) and EnablePageFlip (default off). The first three are correct by default, but due to instability in rare cases EnablePageFlip is disabled by default. Turning on the option EnablePageFlip in xorg.conf reveals no flaws. I have not noticed any glitches with this option on my setup so I feel confident in recommending it. Then the obvious question How good is it? It is good! glxgears gives us an indication. By enabling EnablePageFlip performance is increased from 2050 FPS to about 3270 FPS. A significant boost for tweaking one single option. During the optimization procedures a few interesting observations were made. Primarily the CPU speed does not seem to matter. Most tests were run with the CPU frequency first set to 800MHz, then repeated at 2000MHz. No significant difference related to the CPU speed was noticed. Furthermore, the size of the configured virtual screen does not affect performance. The tests has been run with the default size (1400x1200) and with 3000x2000, but no difference has been noticed. However, increasing the virtual screen to more than 3000x2000 will disable hardware acceleration and of course cripple performance completely. These observations verifies that hardware 3D acceleration is really working and that the radeon driver is taking care of business the way we want it to. TV output is available through the S-video connector on the rear of the Ferrari. Furthermore, no special settings are needed in order to use it. It is immediate available and may be controlled by xrandr. However, the tips below might help to get you started. The external outputs have a property called load_detection, that controls whether RandR should try to auto-detect the output or not. Usually it is a good thing to be able to auto-detect the different output features. However, there are situations when you do not want auto-detection. Remember that we have three outputs, but only two rendering pipelines (CRTCs). What would then happen if we try to auto-detect and configure all available outputs, xrandr --auto, with both VGA-0 and S-video connected? We actually do not know. The internal display may only use the first pipeline, CRTC 0, but that might be allocated by either VGA-0 or S-video. Furthermore, we will have a race condition between the two remaining outputs for the second pipeline, CRTC 1. In order to avoid potential conflicts like that, auto-detection is disabled by default for S-video. The script for dual head management presented in Appendix B assumes that all external outputs may be auto-detected. Thus, if you want the script to consider TV-out as a possible external output you need to enable auto-detection for TV-out. The Synaptics touch-pad is properly configured during the installation, and works well. I use it in conjunction with a USB mouse and both works well in parallel. I have seen some reports on problems with the touch-pad 4-way multi-button, but it works without any hassle for me. Likewise does the mouse wheel. For a complete reference you find my /etc/X11/xorg.conf file in Appendix A. The special key to toggle the touch-pad (Fn F7) also works without any special configurations. When it comes to the Broadcom BCM4306 802.11b/g WLAN chip on the Ferrari you have two choices. The traditional NdisWrapper or the kernel module b43. When I first got this laptop there was no other option than NdisWrapper, but lately the kernel module b43 has evolved and matured. As its name implies NdisWrapper is a wrapper for NDIS drivers, meaning that you use a corresponding Windows driver instead of a Linux driver. For some WLAN chips this is still the only option, but lately many chips enjoy almost native Linux support by means of kernel modules. I say “almost” because many chips need to be fed with proprietary firmware in order to operate. Anyway, this is a step in the right direction, and the final goal must be to free the firmware as well. With FC4 NdisWrapper was the obvious choice, but during FC5 its configuration was (deliberately?) broken by the updates. Most FC5 updates re-installed the now deprecated bcm43xx kernel module, even though it was previously disabled and blacklisted. Thus, for most FC5 updates I had to disable the kernel module once again and re-install NdisWrapper. In my opinion, the bcm43xx kernel module was not mature enough to compete with NdisWrapper at that time. So this was an endless struggle to keep my WLAN support alive. However, with F8 the b43 kernel module is mature, stable and ready for production. How to get the b43 kernel module to work is described below. To use the NdisWrapper please refer to the FC4 version of this document, found at http://ferrari.databa.se/3400/fc4/. First we need to check and install some software so we have the tools we need. Now that we have all the pieces we need installed, it is time to check the functionality and get things working. First we do it manually, to make sure we get the results and feedback that we expect. This is to verify the functionality and simplify troubleshooting, if needed. Now you are ready to start using your new interface. Most likely your first step will be to request IP setting from an DHCP server (dhclient -1 wlan0). The next step is probably to permanent your preferences in the file /etc/sysconfig/network-scripts/ifcfg-wlan0. For further information on wireless networking under Linux, please refer to the numerous HOWTOs on the internet. A good place to start is http://www.hpl.hp.com/personal/Jean_Tourrilhes/Linux/Wireless.html. No special actions were needed for me to get Bluetooth up and running. It was truly amazing how easy it was. However, in order to be complete the details are summarized below. If you have come this far without any problems you are all set and ready to go. To help get you started I have summarized the basic steps to hook up your bluetooth capable phone as a modem. I am using a Sony Ericsson P900 myself, but the steps are general so it should work for most bluetooth phones. The steps below are exactly the same whether you intend to connect to a remote modem or connect over GPRS. When connecting over GPRS the phone also needs to be connected and recognized as a modem. It is the actual dialing later on in the process that differs. With FC4 and FC5 I experienced some issues with the PIN-helper, i.e. the dialog window that prompts for a PIN code. However, no such issues has been observed with Fedora 8. First you need to configure your phone so it is available to your laptop. These steps may vary in detail depending on vendor and model, so the user manual for your phone may be handy. Start by activating bluetooth on your phone and scan for other devices. You should now be able to see your computer. Add your computer as a known bluetooth device to your phone. The phone will ask you for the pin code to connect to your computer. By default it is BlueZ, but you may modify it in /etc/bluetooth/hcid.conf. Use the same pin code when the computer prompts you whether to allow the incoming connection. For convenience you should now configure your phone to allow this device (your computer) to connect without prompting for a pin code. To use the phone as a modem the service of interest is the Dial-up Networking, so note its channel number. That is about it. Now your phone is analogue to an external modem connected to your virtual serial device, /dev/rfcomm1. Configure ppp to make use of it and you are done. Ok, now what? Do I need to repeat all the steps above each time I want to use my phone as a modem? No, for convenience you may configure your system for all this to take place automatically. However, the method you should use depends a bit on your phone. The preferred method is to edit the rfcomm.conf file so a /dev/rfcommX port automatically binds to the DUN service on your phone when the bluetooth service starts. This means that the virtual serial device will be created and properly configured, but not connected. 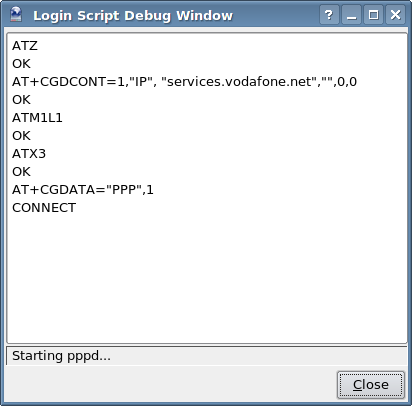 The actual connection will happen automagically when the virtual serial device is accessed. The statical configuration done by editing the rfcomm.conf file cannot handle this confusion. Instead I needed to dynamically decide which channel my phone used for the DUN service today and bind to it. This is done in a simple shell script, that is called just before I intend to connect. Personally, I use Kppp and find it great for both modem-to-modem dial-ups and GPRS connections. So, I have configured KDE to call my script just before Kppp is opened. As mentioned earlier the only difference between dialing modem-to-modem or using the phone as a GPRS gateway to internet is just a matter of configuration. Basic knowledge about modem commands and dialing is assumed, so modem-to-modem dialing is not described here. However, some short hints on GPRS connections are given below. When used in a connection tool like Kppp the sequence of AT commands may look similar to the one in the snapshot below. Notice the two AT strings discussed above. The other commands are mainly cosmetic and may differ depending on your tool and its configurations. To send files to your OBEX (Object Exchange) capable phone you need the packages openobex and openobex-apps. A more convenient way to do this is to use the KDE extension KBluetooth described in its own section below. In the next section you will find a more user friendly and persistent way of connecting your bluetooth mouse/keayboard. 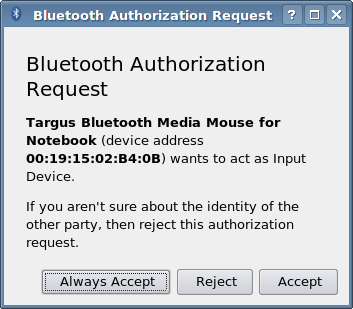 If you are running KDE, there is a Bluetooth extension called KBluetooth available. There is a similar package available for Gnome users, but KBluetooth is discussed here. Before starting to explore it you should make sure that all the details work. For this reason it is recommended that you start out with only the basic bluez-utils package as described in the sections above. Once your bluetooth works as expected, go ahead and install KBluetooth. After installing kdebluetooth you need to restart KDE, by logging out and back on again. Once KDE is restarted KBluetooth will show up as a bluetooth icon in the panel. It offers several useful features. Connecting a bluetooth mouse or keyboard with KBluetooth is really simple. Activate the mouse and move it around and it will be detected automatically. The first time it is detected an authentication dialog is raised. If you want to use the same device in the future without a new acknowledge press Always Accept, otherwise just press Accept. Could it be easier? KBlueMon is a basic tool to scan for bluetooth devices nearby. It reports both device address and name, signal strength as well as what services the device provides. 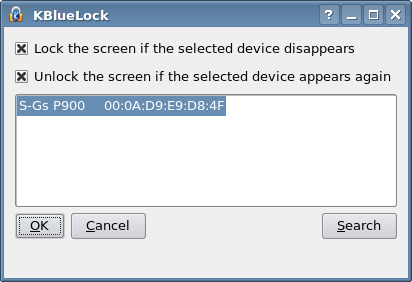 KBlueLock may be used to lock the screen whenever a bluetooth device becomes unreachable. Once the device appears again the screen is unlocked. This is a very convenient security measure to prevent others from fiddling with your Precious when you leave it unattended. 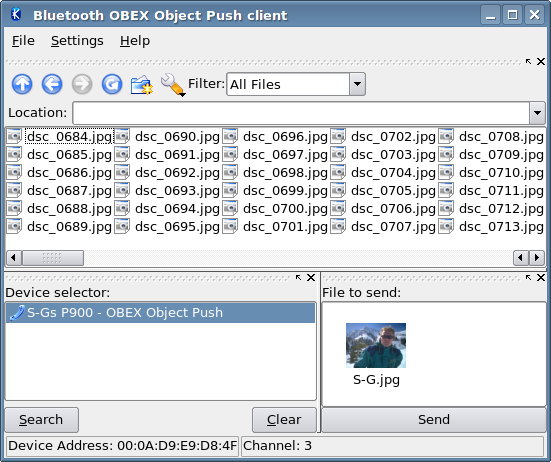 The Bluetooth OBEX Object Push client may be used to transfer files from the computer to your phone or other bluetooth device. IrDA support is provided by means of the package irda-utils, so first make sure that this package is installed on your system. My first attempt started with changing the DEVICE in /etc/sysconfig/irda to /dev/ttyS1 and fire up the IrDA service (/etc/init.d/irda start). Voilà! Watching the log messages verified that all modules were loaded and I had got a new device, irda0, to play with. The device showed up with ifconfig as well. It was just too easy! And yes, although all looked perfect it did not work. Trying the irdadump reviled just a big silence. To make a long story short, the IR-chip in the Ferrari supports FIR (as well as SIR) and FIR is the default, while IrDA by default uses SIR. FIR is what you want to go for since it is faster than SIR and there is a stable Linux FIR driver available for this IR-chip. Below I'll walk you through the steps that got it working for me. Once you have noticed your corresponding setting just exit the BIOS without saving and start your system. to prevent the pcmcia service from intervening. Pay attention to use the settings from your own BIOS for the last three parameters. That is about it, You are done with the configuration. You're all set! The first I did after this was to use irobex_palm3 <SIS-file> to upload and install GnuBox and some other programs on my phone. To do this you need to have the openobex and openobex-apps packages installed and your phone must supports the OBEX protocol. Pretty neat! Fedora x86_64 has the ALSA kernel module snd_via82xx_modem pre-compiled. That module is capable of handling the internal soft-modem. Furthermore, this module is properly loaded at startup. However, the modem is still a Smart Link soft-modem so we need a corresponding user space daemon that utilize this ALSA support for our modem. Notice that the source code distributed by Linuxant is divided in two parts, one general modem daemon and hardware specific drivers in the form of kernel modules. Since we already have an ALSA driver for our model we only need the modem daemon compiled with ALSA support. That part is provided by Linmodems (http://linmodems.technion.ac.il). They do a great job in providing binary modem daemons, by regular compiles of the Linuxant code. This daemon may very well be compiled as a 32-bit executable. Even if we are running on a 64-bit platform. Note: Unfortunately the modem support is still unstable. Depending on the versions of the modem daemon and the kernel it might work. Even though, it is very fragile and might very well break on the next kernel update. Since I do not use the modem I can live with this situation, but I am not happy about it. The installation is not too complicated and is outlined below. Download the compiled modem daemon, SLMODEMD.gcc4.2.tar.gz, or later from http://linmodems.technion.ac.il/packages/smartlink/. # slmodemd --country=SWEDEN --alsa --nortpriority symbolic link `/dev/ttySL0' -> `/dev/pts/5' created. modem `modem:1' created. TTY is `/dev/pts/5' Use `/dev/ttySL0' as modem device, Ctrl+C for termination. For convenience I want the modem driver configured as a service that is started by the Sys V init system. However, the scripts/slmodemd file shipped with the package needs to be modified a bit in order to accomplish this. You will find my modified version in Appendix D.
# A list of all supported country names can be retrieved # by calling "slmodemd --countrylist" from the shell prompt. SLMODEMD_COUNTRY="SWEDEN" # No additional device needed for ALSA mode SLMODEMD_DEVICE= # If set to yes the Advanced Linux Sound Architecture # subsystem is used to make your modem working. USE_ALSA="yes" # Other options, see slmodemd --help for details SLMODEMD_OPTS="--nortpriority"
# tail /var/log/messages ...slmodemd: symbolic link `/dev/ttySL0' -> `/dev/pts/6' created. ...slmodemd: modem `modem:1' created. TTY is `/dev/pts/6' ...slmodemd: Use `/dev/ttySL0' as modem device, Ctrl+C for termination. Just as the system log says you may now find the modem at /dev/ttySL0. However, before starting to use the modem you should continue to read about a potential issue. As mentioned in the beginning of this section there might be a potential problem. It was noticed in my previous attempts to get the modem working and it still exists. It all depends on your setup. If you get it to play there should be no problems, until your next update... Otherwise, you will likely notice something similar to the descriptions below. Once the daemon is running in debug mode, dial the preferred number. The modem goes on-line, dials the number and the other end answers. Before the connection is established the daemon bails out during the negotiation with the other part. The slmodemd process is stopped with Ctrl-C or service slmodemd stop from another console window. If you are lucky the modem might be connecting properly and you may use it to take care of business. Dialing and connecting works fine and the debug output looks ok. However, when the session is disconnected the debug output goes south. It will start to flood the console with the exact same messages as seen above during a connect. In this case we may actually use the modem but need a small tweak. My temporary fix for the problem in this case is to restart the slmodemd service right after disconnecting a session. I configure my dial-up client, Kppp, to execute /etc/init.d/slmodemd restart upon disconnect. Unarguable this is a really dirty fix, but works quite well. The issue reported above together with the fact that slmodemd runs with real-time priority by default may be devastating. When the modem daemon goes insane it will hug your CPU and squeeze it all real hard. If the daemon has real-time priority you will have a hard to get control over you system again and a forced shutdown might be the only way out. Note: You should always run slmodemd with the --nortpriority option set. Failing to do so might hang your entire system.